LED signboards produced a revolution in advertising aspect. It yields up a tremendous attention from the audience moreover creates brand or product awareness even from a faraway distance. LED Sign Boards in Chennai are well-known for its long-lasting quality and sturdiness. Though they are long lasting products, they need a maintenance. Following are the tips to let you know how to take care of the signboards from evading malfunctioning. • To extend the lifespan of LED signboards it is highly advisable to do some routine inspections periodically. • Constantly keep an eye on the LED signboards whether it fully away from the water & moist circumstances. • If you require to lessen the risks to condensation, it is highly recommendable to fully isolate the display unit by using a bolted loop air flowing system. • The most significant thing is to assure the signboards are safer from the bad weather situations or the other intentional interactions, overheating matters. • In several cases, due to more using the LED Signboards without decent care are leading to permanent shades on the screens which limit the quality & life of signboards. 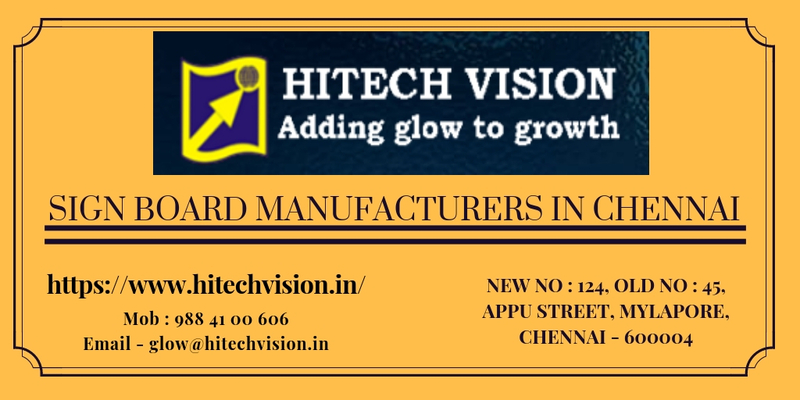 We, HiTech Visions are a well-reputed Sign Board Manufacturers in Chennai who makes valuable quality LED signboards for your business requirements.